It’s been a fuller month than I expected, with a lot of travel and the unlooked-for complications of Thanksgiving and Chanukah falling on the same week. Supposedly we don’t get to do that again for another 77,000 years or so. Most of the food features about the “Thanksgivukkah” mashup this year have been bemused, amused, and imaginative only in the sense of suggesting (always) latkes and sufganiyot (doughnuts) for the Thanksgiving menu. Not in replacement of any other starches or desserts, you understand. They mean in addition to. Forgive me if I can’t dig it, but I don’t think either holiday really benefits from the “double your starches, double your fun” idea. We had a great long weekend up with my in-laws and family in San Jose; and what was on the table? A pretty decent meal by any standards, traditional or California modern. Turkey (kosher, and cooked by accident upside down because my in-laws stuck it in three entire shopping bags and couldn’t tell which end was up–but it came out better than most of their other attempts, so they’re doing it again next year on purpose–I highly recommend it). A little stuffing and mashed potatoes and gravy for those who insisted, which wasn’t us; cranberry orange sauce, a stellar Georgia pecan pie among the desserts. 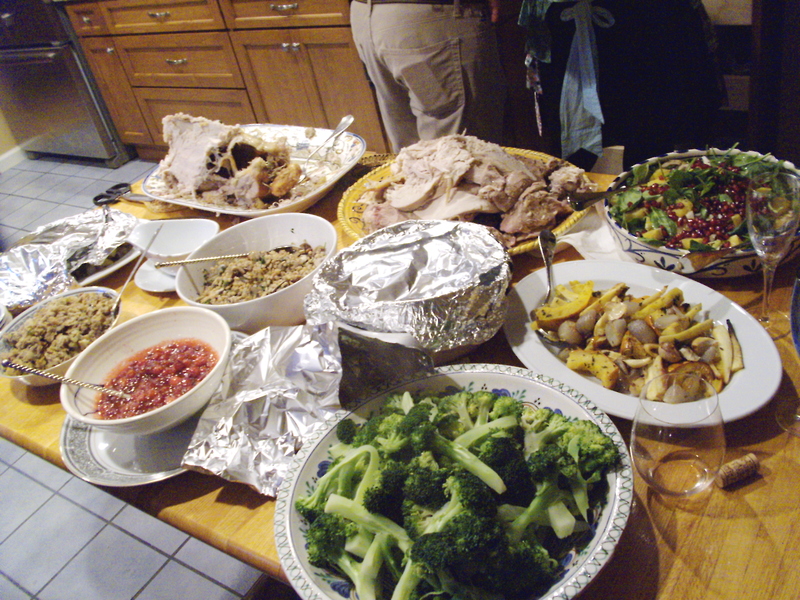 But the rest of it was California-conscious; farro salad with chestnuts and mushrooms, a roasted red-squash-and-onion platter with whole cloves of roasted garlic strewn around, a big green spinach and fennel salad with endive and pomegranate seeds, and my contribution, an impressively large platter of very green, just-steamed broccoli with a spicy mustard garlic dressing that, and I may say so, rocked the Casbah and provided the necessary Jewish influence. Not just because of the olive oil-at-Chanukah factor–which would have been enough for me and was plenty symbolic–but for the balance of a big blob of sharp spicy brown mustard with a big fat clove of garlic. Plus red wine vinegar, olive oil, and a little white wine. . . whisk and taste, whisk and taste. When it’s just sharp enough, still thick but can be drizzled, tastes good and has just the right degree of excessive garlic without going to Gilroy (which, btw, is only about half an hour outside of San Jose and holds a surprisingly popular garlic festival every summer), you know it’s done. The broccoli itself was a little undercooked for me but others insisted it had to be still crunchy to avoid killing the little green vitamins–a new trend in Califoodian philosophy, at least northern Califoodia. It was in the San Jose Mercury News that week or something. But the garlic mustard dressing made up for all that nutritional selfrighteousness and helped the turkey no end as well. Cranberries are well and good and I love them, but they’re no substitute. I maintain [talmudically, in question form]: if there’s no garlic, is it really food? But with a week of too much food and travel and lectures on nutritional trendiness aside, I find myself thinking, do I really need to be thinking so much about food? Southern California makes it easy to eat well with very little effort–even with very little money, as long as you shop at the local Armenian or Latino markets for vegetables and stick to the unbranded or store-brand and whole foods only. However…although it was about 85 degrees out when we came home to Pasadena, the temps quickly dropped and have been in the 50s all week, with and without drizzle (yes, you can pity us sarcastically if you want to. They don’t sell coats of any worth better than a sweatshirt here, so to us it’s cold). I realized it was time for a stew. With, obviously, garlic. Most people think of moussaka as the Greek eggplant-lamb casserole with béchamel topping. 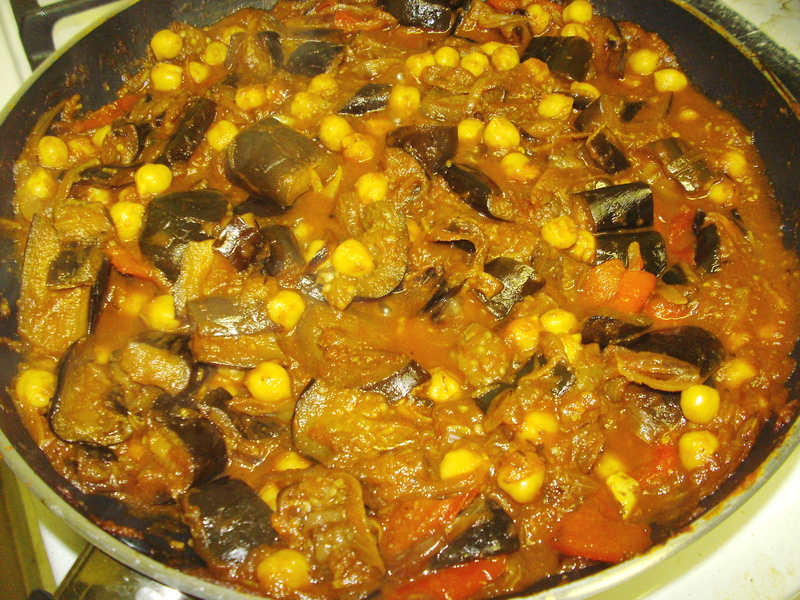 But a much simpler vegetarian eggplant stew with chickpeas, onion and tomatoes is also called moussaka (also found on the web as “musakk’ah”). It stems from Lebanon and is popular throughout the Middle East. Trends go around the web, and for some reason this inexpensive and utterly simple stew (inexpensive in SoCal, anyway–don’t know what it costs for an eggplant in the rest of the country right now) is having its moment. In the frying pan, nearly ready to serve. I made this one with carrots, curry spices, chile-garlic paste, allspice and cinnamon, and a little vinegar and lemon for acidity. Eggplant and chickpea stew can be dolled up with exotic ingredients like pomegranate molasses and allspice–or not, as you prefer, with equally satisfying results. I’ve made this a couple of times with more or less of the sweet-sour-spice inclusions and decided it’s fine either way, and that the main ingredients–eggplant, onion, tomatoes (paste and whole), garlic and chickpeas and olive oil and water and a little vinegar or lemon juice–are what really carry it. Curry powder, bell peppers, allspice and cinnamon, fresh ginger, pomegranate molasses or tamarind sauce, hot pepper paste, cilantro or nigella seed, salt and pepper–any of those are nice if you have them, have the confidence to add them just to taste, and want them in. But you don’t absolutely have to. The cooking’s the thing that makes this dish. As with kormas and curries, browning all the vegetables well before adding the garlic, liquids and chickpeas, then simmering low for a while, is key for developing the flavor. It’s pretty easy. If you have a microwave to steam the vegetables first and your chickpeas are precooked, it goes a lot faster and takes less oil than the traditional version. Either way, depending on your available time and patience, this can easily be a one-pot meal. And as with many stews, it gets better the next day. Microwave the eggplant, onions and bell peppers or carrots or zucchini if using for about 5-7 minutes total in a large covered container just to cook them through quickly before browning. Heat a couple of tablespoons of oil in a nonstick frying pan and brown the cooked vegetables for several minutes. Add the tomatoes and tomato paste, the garlic (the must-have) and ginger (if using), spices, and any additional flavorings except salt–you might not need lemon juice or vinegar if you use the pomegranate molasses or tamarind sauce. You want the mixture slightly tart but not overwhelming. Stir, add the chickpeas and just enough water to make it stew-like in texture, cover and simmer on low heat for about 20 minutes or until the sauce is thickened nicely. Check the flavors and add a little water if it looks like it’s starting to stick to the pan. If you make it ahead, cool and refrigerate it, it’ll be a little more melded the next day.